Andrew and I were planning our November 8, 2008 wedding on the south shore of Long Island and spending the majority of 2008 tending to wedding errands on Long Island. People from LI are very familiar with two major highways - Sunrise Highway and Merrick Road. Each can take you pretty much from Queens to Montauk. A few weekends ago, we were heading to Drew's favorite seafood shack in Rockville Centre, on Sunrise Highway. He asked, "Are we on Merrick or Sunrise?" Easy to get confused as they are both very busy roads that run parallel along the same towns. I told him to look for the elevated Long Island Rail Road train tracks and was reminded of my youth. When you're little, you don't know roads or towns. You simply sit in the back seat and relax while Mommy or Daddy drive you to your destination. You gaze at the store fronts and they become your landmarks. When I was a kid, my parents would take my little brother and me to Nunley's. Nunley's was a small amusement park that was stuck in like 1959, and I always knew we were headed there when I saw the LIRR tracks along Sunrise Highway. My mom said they could never tell me when they planned on going because if something came up and we didn't get to go, I'd throw a fit. To avoid the crying tantrums complete with, "you prommmmmmised" being echoed over and over again, we'd just end up there on a random, clear, summer evening. Nunley's was a glorious step back in time. There was a black and white photo booth and lots of very old arcade games composed of wood and metal. There was the famous fortune teller head eerily sitting in a glass box pumping out a typed fortune and lucky numbers for a dime. The large, indoor carousel had gold rings that weren't easy to reach. If we were lucky Dad would stick out his arm and grab one, because our kiddie arms were much too short. 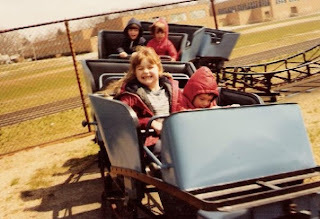 I can still remember the warm summer breeze hitting my face while soaring down the tiny, rusty red roller coaster tracks. My little brother was small enough to ride the kiddie boats that teetered along a small pool of blue green water. We'd play mini golf and end the night with greasy fries and hot dogs. Nunley's was Long Island's Morey's Piers, minus the ocean view. Not too far from our apartment, there's a huge odd-shaped house. It's white with Kelly green trim and shutters with a red front door. Something about this house is just different. It's three stories high which is kinda high compared to the homes in the 'hood. Through the second floor windows-on a rare day when the blids are open-you can't help but notice the faces of Disney characters staring back at you. It's a tad creepy. It makes you wonder ... Who lives there??? Although I've never seen a woman coming or going, I have witnessed a man that looks similar to one of the Seven Dwarves, only not as short, on the grounds. He has two PT Cruisers that never leave his green garage. One is white (it looks like some sort of special edition) and the other is maroon. I noticed the white one is wrapped in a clear plastic bag - cheap plastic, like the type your dry cleaning comes in. A few months ago, I noticed the green blinds were open, giving me a pretty decent view inside the mysterious home. I couldn't help but laugh when I saw two 3 foot tall Mickey and Minnie Mouse figures perfectly posed near the windows. I couldn't wait to tell Drew. He's the only one who knows the house exists. Every day, I feel the need to gawk at this house - I've passed it on my way to work every single day for four years now. I'm always looking to see if something weird is going on, or if the homeowner will be out watering the grass (he never is). I was surprised last week when some men were working on the driveway. I thought this was kind of funny since it seems as if nobody ever drives in or out of this house. The next few mornings I made sure to glare to my right while traveling down this particular street hoping to catch a glimpse. It looked very specific and detailed. A week later, it appeared. Gone was the blacktop which happened to be in decent condition. In its place? A new dark green stone driveway with a HUGE image of a white outlined Mickey Mouse head smack dab in the center. Last night, on our way home from dinner, I pointed it out to Andrew as we passed their house and he gasped and giggled about how unique the guy is. Drew replied, "I hope that guy's married, because he's so strange, what lady would want to date him?" I thought to myself. Disney isn't even really that cool - like at least if it were Hello Kitty, I'd probably have to dump Drew and meet this off-beat character! Six years ago, I met my fiancé on an online dating Web site. After about six months, we became very close via the phone, email and text message and were preparing to meet the day after Valentine's Day -- it happened to fall on a Friday that year. As Valentine's Day neared, he asked me for my work address. Excited, thinking he was going to order me some flowers, I quickly called my favorite mail order cookie company and sent him a huge box filled with heart-shaped cookies and other treats. When February 14 rolled around, I watched as my coworkers' roses arrived, one after another. Anxiously I awaited for my special delivery. Would they be in a box or vase? Would they be attached to a balloon or a bear? While lost in a moment, dreaming of fragrant floral images, I was "awakened" by our company mailroom guy. No, my admirer didn't send me flowers, he sent me what felt like a book. "Hmm," I thought, maybe it's a romantic book of some sort? After I unwrapped it, my mouth dropped. It was as if someone played a cruel joke on me.